ONTARIO, Calif. – 2008 PBR (Professional Bull Riders) Rookie of the Year Reese Cates (Monticello, Arkansas) started his 2017 season off on the right foot by winning the Real Time Pain Relief Velocity Tour (RVT) Frontier Communications Invitational Saturday night at Citizens Business Bank Arena. Cates went 2-for-2 in Southern California and capped the night with an event-winning 89-point ride on Gas Pedal (Humpz N Horns). Cates began his night with an 84.5-point ride on Touch of Class (Walking Lazy J Bucking Bulls). He picked up 80 points toward the world standings with the win and took the early lead in the RVT standings after the first U.S. event on the 2017 PBR schedule. Canadian Justin Lloyd (Tisdale, Saskatchewan) finished second in Ontario after his own 2-for-2 performance. Lloyd covered Slam Dunk (Humpz and Hornz / Sis & Stan Bucking Bulls) for 80 points in Round 1 and finished off with an 87.5-point trip on Captain Jack (Julio Moreno Bucking Bulls) in the championship round. He earned 50 points toward the world standings for his finish. Eric Lee (Adrian, Michigan) came in third place in Ontario after also going 2-for-2 Saturday night. He opened his evening with an 80-point ride on Game Over (Humpz n Horns / Diamond Bar Cattle) then struck again in the championship round with an 84-point ride on Blackie Big Wells (Walking Lazy J Bucking Bulls). The Michigan cowboy picked up 30 points toward the world standings. Cody Ford (Stanfield, Oregon) claimed fourth place for his 2-for-2 night. Ford rode Haunt (McClure Cattle Co.) for 73 points before closing with an 86-point ride on Blowing Smoke (Humpz and Hornz / Sis & Stan Bucking Bulls) in the championship round. Ford picked up 20 points toward the world standings for his finish. Robson Aragao (Aracaju, Brazil) rounded out the Top 5 after riding El Capitan (Humpz and Hornz / Sis & Stan Bucking Bulls) for 85 points in the championship round, he earned 15 points toward the world standings for the finish. The Real Time Pain Relief Velocity Tour continues next weekend in New Town, North Dakota, Nov. 18-19. 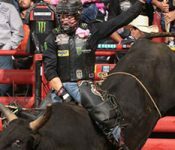 The PBR’s Real Time Pain Relief Velocity Tour (RVT) began in 2014 as the premier expansion tour for the PBR. The RVT brings the excitement and talent of the PBR that fans have come to expect from the leader in the sport of bull riding to cities across the U.S. The tour is 100% produced and operated by PBR, providing fans the highest quality experience available. The RVT is proudly supported by Real Time Pain Relief, Pendleton Whisky and the South Point Hotel and Casino.